or as a hybrid solution. Cloud9 were the world’s first company to offer a multi-tenanted network-agnostic and platform-agnostic cloud call recording solution. Offered as a SaaS model means that there is very little or no CapEx required and as you are not buying licences, you pay monthly only for what you use. Cloud9 is flexible to match your requirements, which is particularly beneficial if your business is growing rapidly or is subject to seasonal fluctuations. 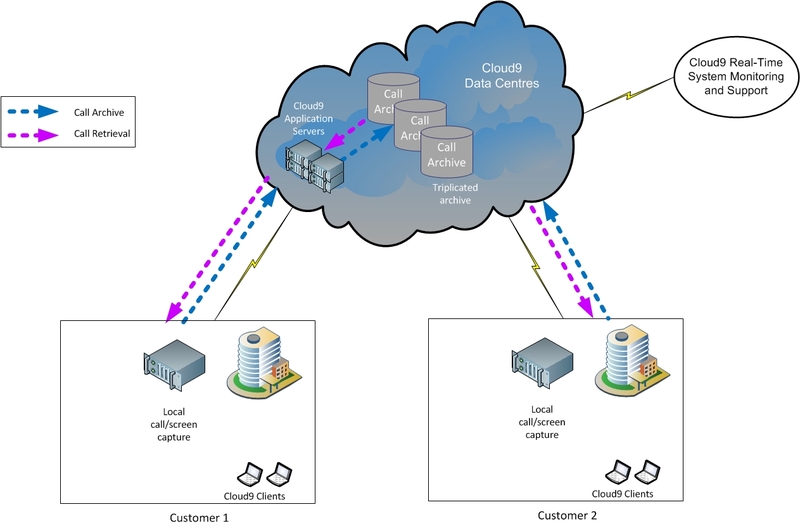 The Cloud9 application suite has, at its core, an innovative call capture system. It is designed to capture both current and emerging forms of communications media as well as cater for the growth in changing user requirements. It offers a complete multi-media capture solutions for agent and business performance analysis, quality assurance and compliance purposes. Calls are encrypted and archived in triplicate to our secure data centres, and are available for replay 24 x 7. Alternatively local storage is available, if this better meets your business requirements. Not all call recording systems are the same. To learn more about how Cloud9, our cloud call recording solution, can benefit your business, please contact us.